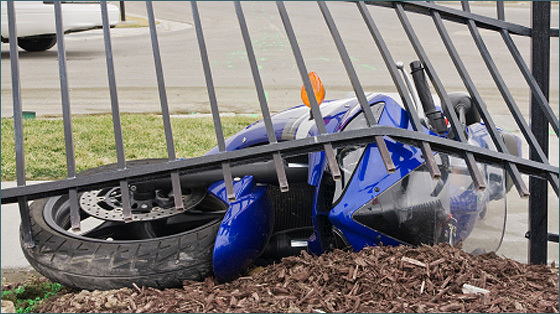 Motorbike accidents can cause some of the most serious and debilitating injuries. They often result in the most distressing and difficult cases that we have to deal with at Fylde Law. What's more, they are frequently the accidents which could have most easily been avoided. If you have been involved in a motorbike accident that you consider was not your fault or only partially your fault, Fylde Law Solicitors will take on your claim on a no win-no fee basis. Statistics show that people riding motorbikes are not only at much a greater risk of serious injury than car drivers, but also more likely to be involved in an accident than a car driver. There are many reasons for this, not least of which is the lack of awareness of other road users to the presence of motorcyclists. Aside from the lack of awareness of the drivers of cars, lorries and buses, people riding on motorbikes face other dangers which often pass unnoticed to motor cars. A defective or potholed road surface is much more dangerous to a person riding a motorbike, particularly when driving in traffic, when the pothole or defect might only become apparent when the car you are following has passed over it. This also applies to objects in the road such as stones or other obstructions. Liquid in the road from spillages of fuel or water are also much more dangerous to motorcyclists, particularly if the liquid freezes. Fylde Law have recent experience of successfully bringing compensation claims for a failure on the part of the local council to adequately grit a road. Motorcycle accidents can also happen as a result of legally and properly undertaking motor vehicles in stationary traffic or legally and properly filtering. Members of Fylde Law’s Motorbike Accidents Team ride to work themselves and are fully aware of the dangers of the daily commute on a bike. In our experience a car driver will often frequently claim that an accident occurred because the motorcyclist was driving too fast or in a dangerous way. Fylde Law have the experience to rebut any allegations properly on your behalf and have the specialist contacts to help us produce the evidence to do so. If you or a relative have suffered a serious injury in a motorcycle accident, our specialist team have extensive experience of serious injuries, including brain injuries, spinal injuries and amputations of limbs. Fylde Law’s Specialist Motorcycle Accidents Department offer a no win/no fee administration in almost all motorcycle accident claims and will leave no stone unturned in our efforts to maximise your compensation. For expert advice, please call us on 01253 730 070 or contact us via the quick link on this page. *Please be aware that we can represent you even if your insurance company have appointed someone else to do so. It will not affect your rights or your insurance. It will just mean that a highly competent lawyer whom you have chosen and who has your best interests at heart will administer your claim. Please remember that your insurance company has no right to instruct a solicitor to act on your behalf and you have no obligation to continue with them when they do.